The Strategic Freight Plan is guided by the overarching goal of providing a safe, secure, effective and efficient freight transportation system that fosters the economic vitality and livability of the Tampa Bay region. Eight objectives define the structure of the plan. The Goods Movement Advisory Committee (GMAC) developed plan objectives addressing freight mobility concerns and others addressing the compatibility of freight transport activities with the livability of communities and prosperity of the region’s business centers. 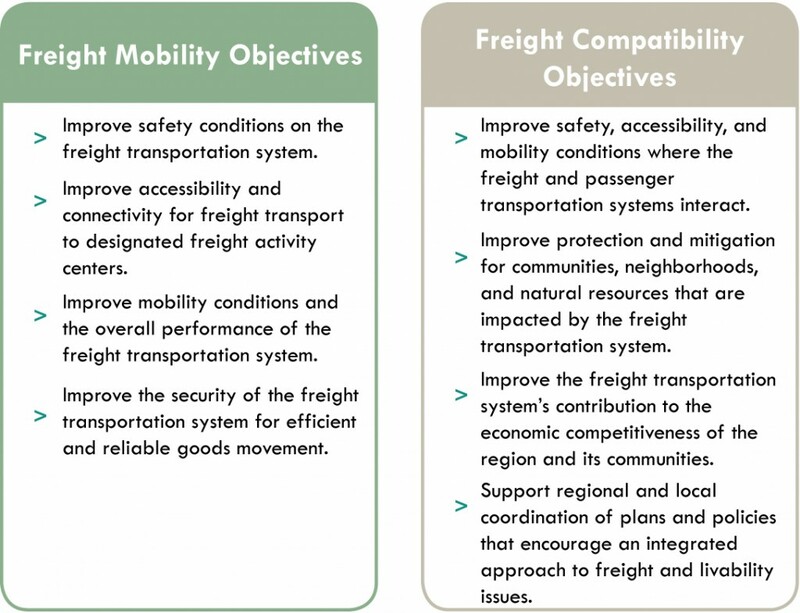 Freight mobility objectives focus on the performance of the freight transportation network, emphasizing safety, security, connectivity, and mobility, so that goods can be efficiently transported to destinations. Compatibility objectives address the preservation of community, economic, and environmental assets to maintain and enhance the economic competitiveness and quality of life of the Tampa Bay region. The plan objectives guided the development and evaluation of freight mobility needs throughout the region. Performance measures were defined and applied in the evaluation of freight mobility needs to determine how well certain freight transportation improvement needs and strategies achieve the plan objectives. This analysis resulted in the identification of priority transportation investments for the region. Several recent initiatives and evaluations conducted by planning and intermodal transportation agencies in the Tampa Bay region have identified transportation improvement needs to facilitate the mobility of people and goods on the freight transportation network. These needs and other needed freight mobility improvements defined through capacity and issue assessments undertaken as part of the Strategic Freight Plan comprise the inventory of freight mobility needs for the region. Through the needs assessment, four categories of freight-related needs were identified, including capacity, operational, maintenance, and safety and security needs. The capacity and operational needs were evaluated as part of the Strategic Freight Plan to determine the most pressing freight mobility needs in the region. The maintenance and safety and security needs were inventoried and coordinated with state and local agencies so that these needs could be considered in their respective roadway maintenance programs. Capacity needs include new travel lanes, special purpose truck lanes, frontage roads, and new roadways or interchanges to accommodate travel demand, reduce congestion and enhance system reliability. It also includes separated grade crossings at freight railroads through the construction of bridge overpasses. Capacity needs are generally recommended to address congestion resulting from roadway volumes that cannot be served efficiently by the existing facility or network. In many cases, the flow of traffic along a roadway can be improved through operational strategies such as signal timing optimization, Intelligent Transportation System (ITS) strategies, improved signage and wayfinding, or enhancements to throughway and/or intersection geometry. From a goods movement perspective, operational improvements can be designed to better accommodate trucks, which tend to have wide turning movements and slow acceleration. Addressing truck operations issues along a corridor or at an intersection can significantly improve travel time reliability along a roadway as well as accessibility to industrial and commercial uses. Operational needs for both roadway corridors (corridor-based) and at specific locations (freight hot spots) were identified. In addition to capacity and operational needs, the ongoing maintenance of transportation facilities is a significant factor in providing efficient and economical goods movement. Facility maintenance is typically scheduled by implementation agencies, public works departments, private owners (e.g. CSXT), or port and aviation authorities on a separate basis from capacity and operational improvements implementation. The identified maintenance needs have been catalogued and will be provided to the appropriate entities for review and inclusion in future maintenance work. The needs assessment process yielded several needed improvements to address safety and security issues. Safety needs address potential hazards posed by freight operations to industry and/or logistics personnel, non-freight users of the shared transportation network, or property. Issues potentially impacting safe railroad and roadway operations were identified in the corridor screening process. Security needs address measures taken to protect strategic transportation infrastructure, vehicles, cargoes, and personnel from potential threats posed by nature and people. Security needs were also identified through coordination with intermodal entities (airports and seaports), whose facilities and operations are subject to security requirements stipulated in federal legislation. Freight capacity and operational needs were organized as either a corridor-based need or a freight hot spot need. Corridor-based needs are linear in nature and address existing or anticipated capacity deficiencies and/or operational issues. 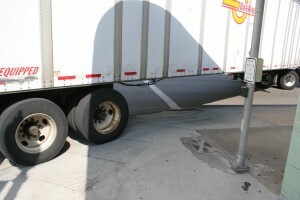 Freight hot spot needs are specific locations, such as intersections, where roadway geometric or operational conditions inhibit truck movements in one or more directions. Whereas corridor-based needs generally represent long term improvements that require substantial planning and financial resources, many freight hot spot projects located at intersections or other specific locations may be addressed relatively quickly and affordably. A set of weighted criteria was developed to evaluate the relative priority of the identified freight-related needs. In general, the criteria address safety, accessibility, mobility, modal conflicts, land use compatibility, and economic factors within the limits or vicinity of each corridor-based and freight hot spot need. Since corridor and hot spot needs are different in nature, the two categories of needs were evaluated separately using slightly different indicators. The principal difference between the evaluation processes is that corridor-based needs primarily use long-term trend data to evaluate performance, while the performance evaluation for freight hot spot needs relies on existing conditions data. The freight system performance evaluations indicate the relative priority of the identified corridor-based needs and hot spot needs as they pertain to supporting regional goods movement. Needs are ranked high, medium, and low from a freight mobility perspective.